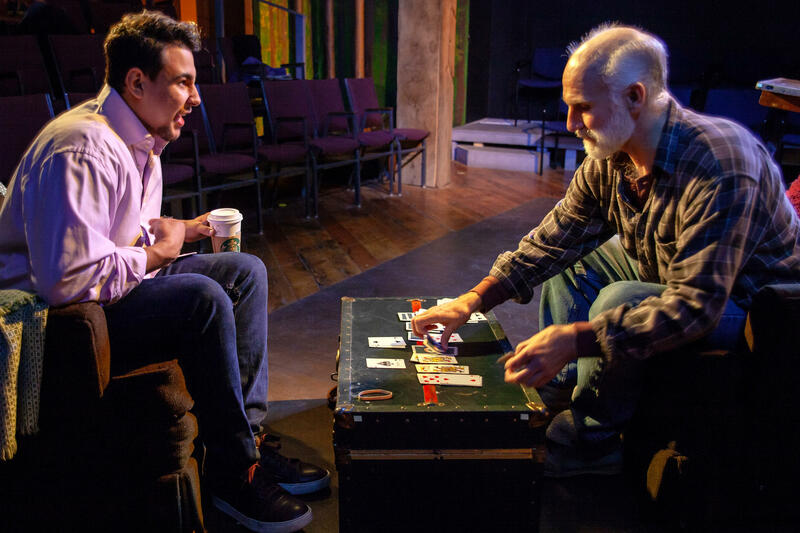 (L to R): Dennis Kleinsmith as Simon Grindberg and Ethan Kankula as Peter Chandler in "The Stone Witch" by Shem Bitterman at Theatre NOVA. Theatre NOVA presents the Michigan premiere of “The Stone Witch” by Shem Bitterman Oct. 19 – Nov. 11, 2018. Theatre NOVA, Ann Arbor’s resident professional theatre with an exclusive focus on new plays and playwrights, presents the Michigan premiere of “The Stone Witch” by Shem Bitterman. Dennis Kleinsmith as Simon Grindberg in "The Stone Witch" by Shem Bitterman at Theatre NOVA. “Extraordinary art must be tamed," says reclusive genius Simon Grindberg, the world’s most illustrious children’s book writer. But, holed up in a remote cabin with his next masterpiece a decade overdue, it's not clear who is the master and who is the servant. When Peter Chandler, a starving artist with literary aspirations of his own, is hired to help “The Great Man” finish his overdue book, an unlikely friendship ensues, haunting secrets emerge, and the lines of reality begin to blur. Ultimately, both men must face the terrifying beast dwelling in the dark forest, in a struggle for their artistry, their sanity, and their souls. 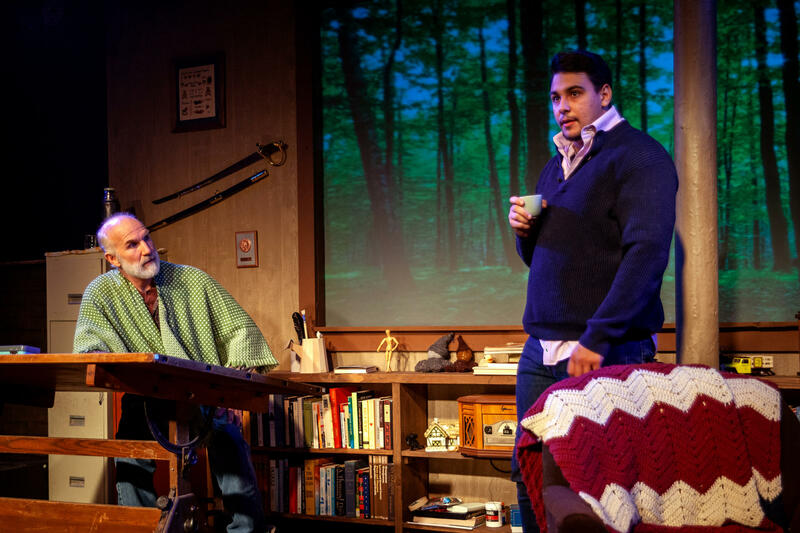 (L to R): Ethan Kankula as Peter Chandler and Dennis Kleinsmith as Simon Grindberg in "The Stone Witch" by Shem Bitterman at Theatre NOVA. Directed by Nancy Kammer, “The Stone Witch” features Dennis Kleinsmith, Ethan Kankula, and Diane Hill. The production team includes Forrest Hejkal (scenic design), Jeff Alder (lighting design), Harper Wildern (art projection) Haley Cook (costume design), Carla Milarch (sound design), and Alona Shewach (stage manager). 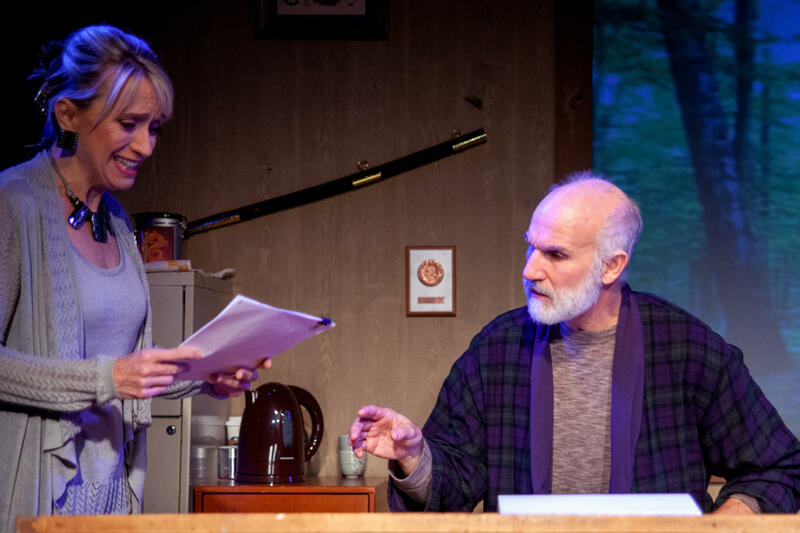 (L to R): Diane Hill as Clair Forlorni and Dennis Kleinsmith as Simon Grindberg in "The Stone Witch" by Shem Bitterman at Theatre NOVA. “The Stone Witch” will run October 19 through November 11, 2018, at Theatre NOVA (410 W. Huron, Ann Arbor), a downtown performance space. 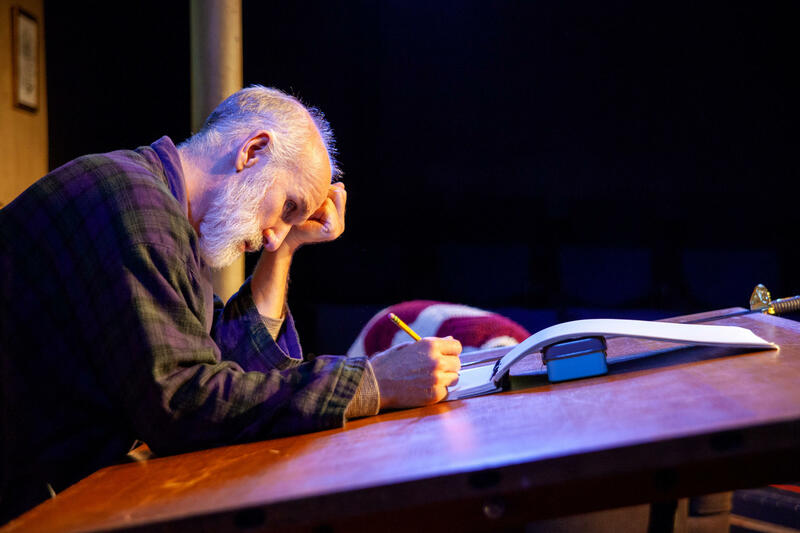 Performances are Thursday through Saturday at 8:00 p.m., and Sunday matinees at 2:00 p.m. Theatre NOVA features free parking for patrons, as well as quick access to the city’s restaurants, bars, bakeries, and coffee shops. This week, "Art and Soul" focuses on the performing arts in our area. 89.1 WEMU’s Lisa Barry is joined by local writer and reviewer Jenn Mckee and local actor Dominic Seipenko, talking about his part in the musical now being put on by the Ann Arbor Civic Theatre…and even sings a bit! This week, "Art and Soul" is about the local performing arts scene. 89.1 WEMU’s Lisa Barry is joined by local writer and reviewer Jenn McKee and an organizer and performing from the upcoming Nashbash Music Festival in Ann Arbor, Judy Banker.